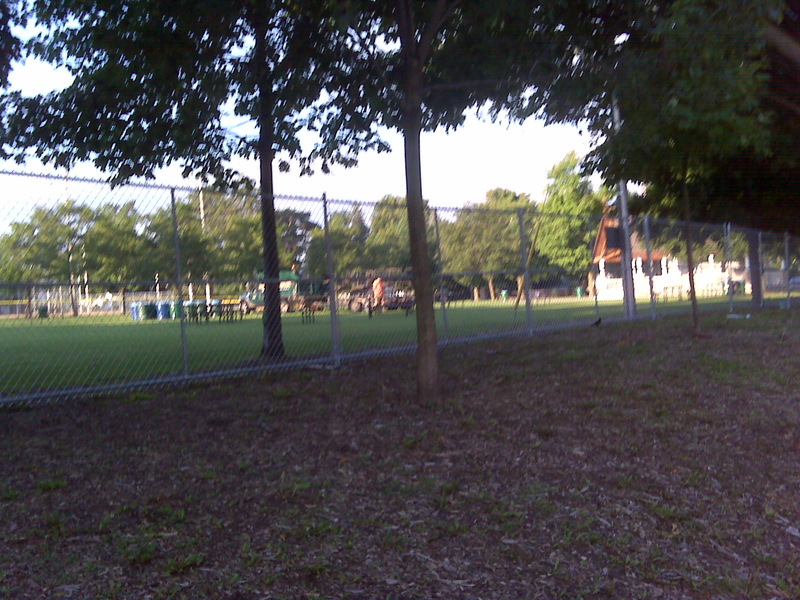 A reader sent in a note that as of midnight Thursday night, a perimeter fence had been erected around our Town Park. Another reader sent in a quick snap of the fence and indeed, yep, there it is (picture is slightly blurry, sorry folks). 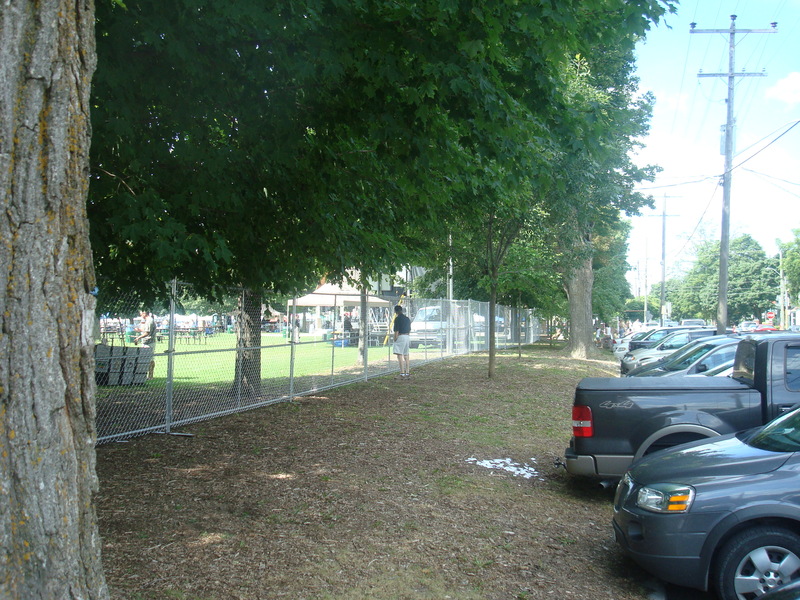 An approximately 6 foot tall fence completely surrounds the Town Park. Just as an aside, another concern emerges when looking at the picture. Clearly visible in the picture is Town of Aurora staff, unloading picnic benches from a Town owned vehicle. It begs the question, in addition to the $2000 the Town has fronted this event, are we as taxpayers’ also on the hook for staff and municipal town resources? Are we paying for set up, clean up and take down of this event? It would be nice to know just what this event actually cost us. 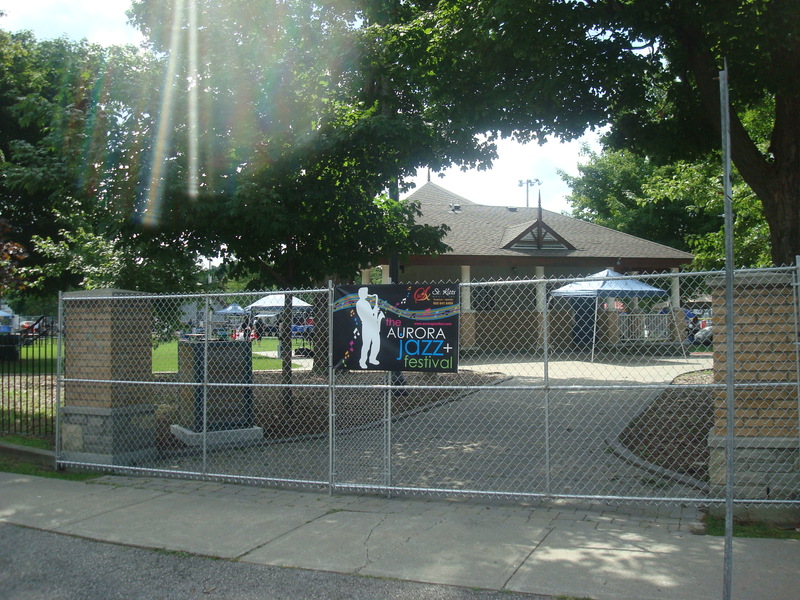 Last year, the “Aurora” Jazz Festival was not encased in steel fencing. The park was open to anyone. You could shop at the Farmer’s Market and then sit a picnic bench and listen to music. It was, supposedly, a “special event” associated with the Farmer’s Market. To spark “awareness” of the Market and/or “grow” the market. Last year, Music and Farmer’s market vendors mingled together in an open park. 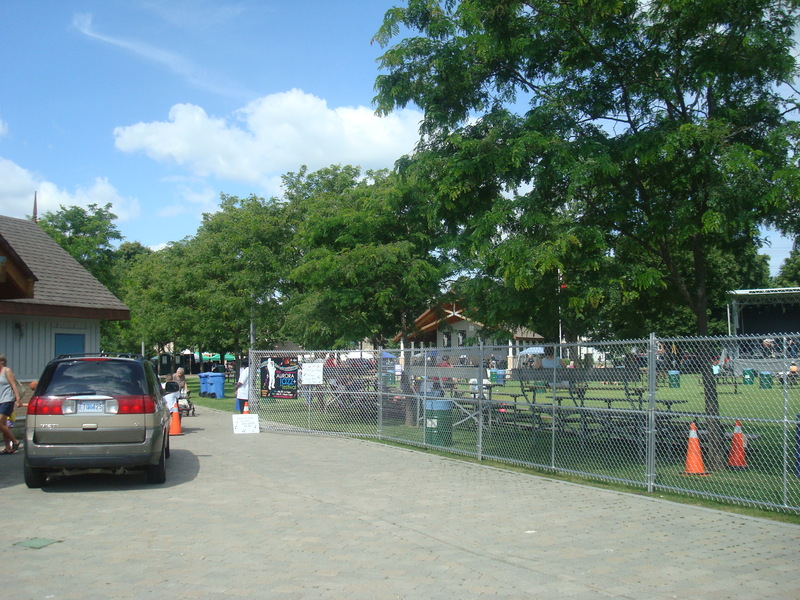 This year, we have farmer’s market vendors turfed from the park and replaced with “other” vendors, perimeter fencing erected around the park and a fee to even enter it! So, if we understand the quote correctly, you, the tax payer are to pay $5, to enter YOUR park, so that a private business, St.Kitts Music, producers of the Festival, can “grow” their venture?? In the same article, Ms. St. Kitts says, “The August long weekend belongs to the Aurora community.” Really? Tell that to the Farmer’s Market vendors, tell that to the residents who live around the park who weren’t consulted about a 48 hour music festival in their neighbourhood, tell that to the tax payers of Aurora who fronted $2000 (that we know of) to this commercial venture. Then explain how this is a “community” event. We have received a number of comments about the lack of site activity. We apologize. Sometimes life and work take over and something has to give. The last couple weeks — it was this blog that suffered. We’ll try to do better. You should expect to see a new post this weekend. Your patience and understanding is appreciated. We also have heard that some folks have had trouble accessing the site. If so, please try to connect directly from the url www.AuroraCitizen.ca. It is possible one of the older links is broken. If you are still unable to connect, please let us know. This is the Holiday Edition of the Aurora Citizen. Please, just comment on the things you love… for the things you hate, we have the other 51 weeks. My name is Elizabeth Bishenden. Some of you know me through a few local activities, some of you don’t. I’m the first guest moderator at the Aurora Citizen and I think I’ll be around until about mid-November. For the last few days I’ve been moderating the blog. I’ve consulted at times with the blog owner about different kinds of posts. The person who owns the blog (yes, I do know who it is, but until that person chooses to reveal her/his identity, I have no interest in providing revelations) has been helpful with information about the editorial policy of the blog and the kinds of items that have been accepted and rejected in the past. This blog does not and will not investigate allegations to determine if they are based on fact. This is simply a communications channel to facilitate community dialogue. It is not an investigative facility — we leave that to the news media. If these allegations were documented (i.e. viewed on video, previously reported by the paper, documents supplied, etc.) or filed by a person willing to accept responsibility for making the allegations we would publish the comments. Until such time, allegations will be rejected. As a note, sometimes it is just one line in the post that causes problems. Neither the blog owner nor I are interested in editing your posts. That would open a can of worms for many people. We will either post your entire response or reject your entire response. If it’s rejected and you still think it is valid, read it again after 24 hours. (I’m a house league hockey convenor — the 24 hour rule is huge with me. Edit your response and try again. If you have an issue with a deleted post, you can send me an email via the connections at the AC for a private response about your post. I might not answer promptly, but I will answer in a few days with some information. Some people have accused the AC of being biased in the past. I have to say that based on the posts I’ve moderated in the last few days, the AC needs alternative viewpoints about Town Council and it especially needs discussion on topics other than Aurora Town Council. Whatever you’re interested in, I’d love to see some support and reasoning for every point of view about your subject. I will, however, remind everyone that support and reasoning are key to having your post approved. Unsubstantiated allegations were never allowed on the AC and they won’t be approved while I am guest moderator, either. Thanks for joining us on the new platform for Aurora Citizen. Please let us know if you experience any difficulties. For those renewing your RSS, if it tells you you already have a feed at this address, simply add “2” to the end of the title so you have a second feed. We will be deleting the original feed at some time in the future. When making comments, you will also need to input a user name by hand versus the default of anonymous — your email address is not required. Please bookmark the site and tell your friends. Let’s keep the conversation going.